Kudos to all of our students for their generosity and respectful behavior during our third annual community service day! The organizations we helped were most grateful for the items collected - thanks for making a difference! Hopefully our students learned a bit about the organization their team donated to and realized that any contribution (small or large) makes a difference in the community. During the month of December we enjoyed fabulous performances by our music ensembles - congratulations to all of our students who performed! Enjoy the break from morning rehearsals, but be sure to check your lesson schedule when you return. 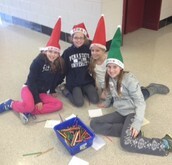 December 13th marked the mid-point of the second marking period. Please remember if you have not done so already to sign up for the parent portal. Not only is this a great way to check your child's progress,but beginning with third marking period all report cards will be issued via the portal. I wish all of you a wonderful break filled with celebrating your family's traditions. See you in 2014! 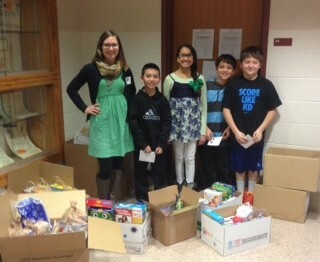 Students collected breakfast items for the Norristown Hospitality Center. Other sponsored charities included Mission Kids, Cradles to Crayons and the Leukemia and Lymphoma Society. 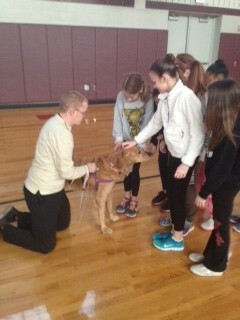 Students enjoyed meeting Faith (the golden retriever) and learning about the work of the SPCA. 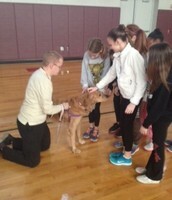 They contributed pet items to help the SPCA. Students created cards for patients at a local hospital. 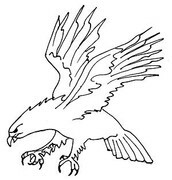 January 2014 Letter Day Calendar - click here! In order to begin the process of determining math placement for 7th grade, all 6th grade students will take part in testing on January 15th. They will also take a screening test on January 22 (Constellations and USA) and January 23 (Celestials and Astronomers.) These tests are not part of the childrens' math grades and they are not something for which to "study." If you are interested in participating in Reading Olympics there is still time to sign up with Mrs. Conger in the library media center! Forms must be turned in by January 17th.